Hens and chicks plants are mat-forming succulents that produce clusters of rosettes. The parent rosettes are the "hens," and the smaller rosettes that spring from them are the "chicks" or "chickens." This low-growing perennial will quickly spread to 2 feet or more in width through propagation or self-propagation. Although grown for its foliage, hens and chicks do sometimes flower on a tall flower stalk. 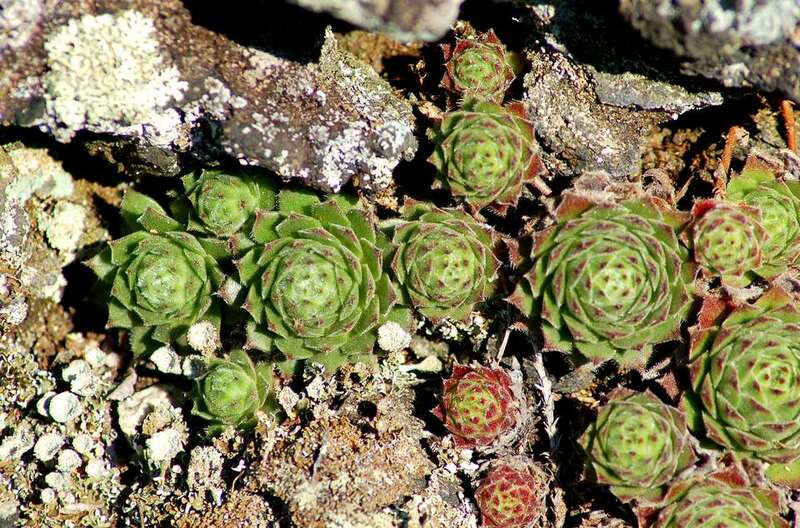 The foliage of hens and chicks plants is most typically red, green, blue, gold, copper, or some mixture. As drought-tolerant succulents, hens and chicks plants are rock-garden perennials par excellence. Their need for sharp drainage makes them a perfect fit. Another option is to grow this succulent in cracks, whether it be in stone walls or between garden stepping stones. As a ground cover, you can replace a lawn with hens and chicks plus creeping sedum. Of interest is that in their native Europe they were grown on thatched rooves to help prevent lightning fires and provided a winter vegetable as they are edible. While you could eat them in an emergency, it's nice to know that they are deer-resistant if that is a concern in your area. Your hens will spread via underground roots and each growing season will produce at least four chicks. These little plants are called offsets and can be broken off and transplanted to new areas. The hens may flower in the summer, which can happen after one year or after several years. The flowers are dramatic but the mother hen will die after flowering. Remove the dead mother hen plants. Flowering can be a sign of poor conditions, so you might check that drainage and sun are adequate in the spot where the mother was growing. This plant does fine in poor, sandy soil. The main soil requirement is that the plant is grown in well-drained soil. If your soil is heavy and doesn't drain well, work some peat into it. The hens and chicks plant also prefers a soil pH that is neutral (around 7). These are drought-tolerant perennials. Give newly-transplanted plants sufficient water to help them get established. Once established, try to avoid ever over-watering them (check to see that the soil is dry before watering). Plant care in the South will focus on providing adequate moisture during the hottest, driest periods of the summer. Hens and chicks can be grown in planting zones 3 to 11. Sempervivum species are very cold-hardy and have been known to thrive in winters from Michigan to Colorado, with temperatures to -30 degrees Fahrenheit. This ground cover will thrive in poor soils, so there is no need to fertilize hens and chicks plants. To propagate, simply split the offsets from the parent plant and transplant them. You will only need a shallow hole where you can spread out the roots. Replace the soil to the crown of the plant and gently compact the soil around the roots. You can give it a light watering, but let the new plant dry out between waterings. Plants will spread on their own under ideal conditions. Common container uses of hens and chicks include window boxes and concrete or stone planters where their low-maintenance qualities are appreciated. You can feature your hens and chicks in a container such as a strawberry pot if you keep dividing the offsets. To grow indoors, give the plants at least six hours of bright, indirect sunlight per day and be careful to only water them when the soil has dried out completely. You can grow hens and chicks from seeds. For a larger area, sprinkle the seeds on top of the soil or a gravel mix. They need light to germinate and you should keep them moist but not wet. They should sprout within three weeks. Then add some fine gravel and mulch. If you wish to start fewer plants, use peat pots and a starter mix of soil.